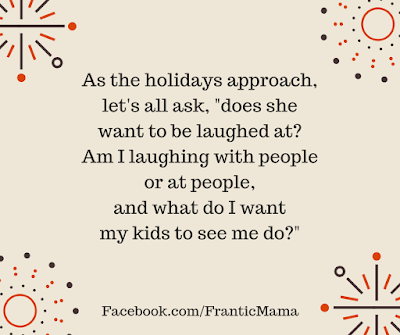 Frantic Mama: Laughing with me or at me? I've known from a young age I am more sensitive than the average Joe. If there were a scale (1 being extremely hardened to ten being extremely sensitive, I'd be a solid 8 (9/10 if I'm lacking sleep)). It helped clarify things for me when I stumbled upon the Highly Sensitive Child and the Highly Sensitive Person when my son was in preschool and I was trying to put my finger on what made him a little 'different' or, shall we say, quirky, than roughly 75% of kids (about 25% of the population, according to the author, falls into the Highly Sensitive category). Bingo! That's it! He has a heightened sensitivity to the world around us. I remember it felt like one of those cartoon light bulbs turning on above my head. (Note: despite the name, the trait of high sensitivity isn't all about 'getting feelings hurt easily,' like most of us associate the word 'sensitive' with. That just happens to be the aspect I'm focusing on today). As it turned out, my husband read the books too and figured out he was the same way. So I suppose we are a family of highly sensitive people. I've embraced this trait now and I actually enjoy watching it manifest in my children. Being highly sensitive may not make things easier, but it can be a gift in many ways, and it can help us grow our empathy. Still. With gifts come challenges, yes? I HATE feeling like I am being laughed at. I hate it when I'm not taken seriously. I'm sure no one likes it, as children show hurt when being teased early on. That feeling has never gone away for me. How about you? It's not fun for anyone, right? Nothing shuts me down faster. The walls go right up. As soon as I start to feel like the joke is on me, a barely-concealed mean/sarcastic face is being made about something I said, or there's a chuckle at something I said that was not intended to be funny, I commence the shut-down process. A. Escape the conversation (in the case of a fight or flight response, that definitely falls into the second category). B. If A is impossible, I try to refocus the conversation on someone or something else, the self-protective message being, if you are going to make fun of me, this part of the conversation is over. Neither of these responses are perfect or ideal, I guess, but I'm always a little in shock in the moment (the comebacks I come up with at 2 a.m. are so good though!). Shockingly to a highly sensitive person, some people do NOT appear to pick up on Cue A or Cue B. How do I know this? Because they repeat the behavior! Over and over again. What do you do if there is a certain person or people in your life who find a way to laugh at you every chance they get? I'm asking, because I don't know! Maybe I'm an easy target because I wear a soft-shell, but I feel like there is a small handful of people in my life who have demonstrated this behavior on a frequent basis. People I know are decent people-- they're certainly not evil! So why do they do it? Or is it social awkwardness on their part? Do they laugh our of nervousness or anxiety? That at least gives me some patience with it. Or is it something darker? I'm not sure. It may make things worse. Or at least painfully uncomfortable. 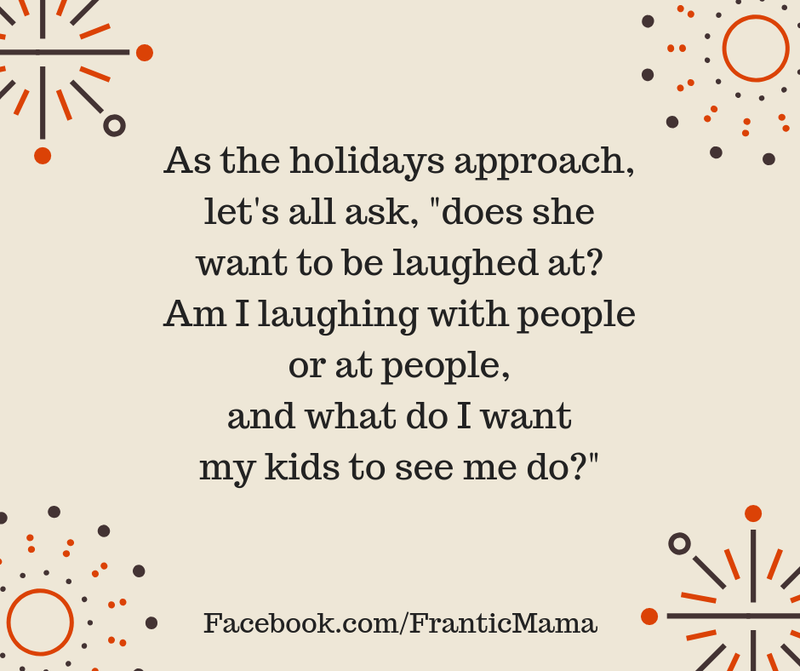 What I do know is that I don't laugh at people who aren't making jokes, and I'm teaching my kids to do the same. I'm also asking on behalf of us 7 plusses on the scale, to all of you 5 and under folks, to take a step back occasionally during social visits with your friends and family. Do you notice you laugh at one of them frequently? Are you sure they're trying to be funny? Are they truly enjoying the conversation? It's good to remember not everything is a joke, and not everyone wants their comments laughed at or to see eyes rolling when they talk. It's belittling and hurtful, even if we try to be brave and smile through it. That's my PSA for the day, folks. Especially as Thanksgiving is hurtling rolling towards us. We'll all be in close quarters with lots of people soon. I'm far from perfect, but I know I have a heightened awareness of feelings-- even more so now that I have children-- and I'll be working hard to be kind to those around me. That's what I want them to see. There are a lot of feelings out there, and it sure makes the holidays more fun when we take a step back and think about how we talk with people and the reactions we give them. P.S. And if you are thinking hmmmm is this about me? Maybe pause and ask yourself, hmmmm why do I think this could be about me?